I am going to show you how you can easily make a chandelier chain cover. I created this fabric chandelier chain cover as a project for a decorating book I wrote back in 1994 that was entitled, Instant Decorating. At the time, purchased chandelier chain covers required you to have to remove the chandelier from the ceiling and then slip a sleeve of gathered fabric over the chain. Way too hard – and I would have needed the help of my husband or an electrical contractor. Now chandelier chain covers or sleeves as they call them can be found in many decorating catalogs. They sell about $39.00. Making your own will not only cost you a lot less – but you are not limited to choose from only a few select fabrics. You can use any fabric you like to coordinate with your decorating color scheme. The chain cover is really easy to make and you don’t even have to use a sewing machine. You can use fusible web. A chandelier chain cover instantly transforms an ugly chain and adds a decorative finish where you least expect one. 1. Lay fabric on cutting surface and cut a piece of fabric 7″ wide by two times the length of the chain. 2. Fold and iron all edges over 1/4″. Iron on the adhesive or apply fabric glue to the wrong side of fabric, then fold and press to create finished edges. 3. Using a needle and thread, sew a running stitch up each side. I made my stitches really big so you could see. (You will want your stitches smaller, but they don’t have to be perfect.) You can do this on a machine if you have the skills. When you get to the end, knot the bottom. Repeat on other side. 4. Gather the fabric along the thread on each side until it is the length of your chain. Knot the top thread. 5. Using your hands evenly arrange the gathers along the entire cover. Place one side of sticky velcro on the outside, left. The other side of the Velcro to underside, right. Make sure to press the Velcro firmly into the folds. Cut away any excess. Want to see the cover on a different light fixture? Here is a long one I made for the chandelier in my two-story foyer. If you want to buy a ready-made chandelier chain cover, you can find white, burlap and linen ones, HERE. Wow! You do a nice work and make it look so easy! I am up at 5:00 a.m. looking on EBay for Chandelier covers to purchase for the approaching Holidays. Somehow I came across your website. What a wonderful surprise!! I look forward to learning more tips and ideas from you. Hi Diane and Readers! I actually found several of these at TJ Maxx one year and used them to cover the chain on my outdoor swings! Plus it keeps the extra chain from rattling … 2 for 1! The ones I found have snaps. I don’t understand how long the adhesive tape needs to be? You said the length of the chain; however, where is it placed on the fabric as the fabric is to be double the length of the chain. This is for my son. What fabric do you recommend? Thank you for your help, I need a black one and cannot find a ready made one. to cover a lot more ground when you book the longer tour and that means you’ll see a lot more beautiful sights. to survive in the competitive market. I like the way you made your chain cover. I need to get to work and make some for my chandeliers. Thanks for sharing. In making a chandelier chain cover, would it be beneficial to use fabric that is cut on a bias? Will fabric drape/fold better? My chain will be fairly long – better to make one long cover or separate shorter ones? Hi Ann – If your chain is very long, making a few smaller covers would be fine since they will be gathered. You will not see where one section ends and the next section begins. It is pretty easy to attach the cord cover even if it is in one piece, though since when you attach it, it is already gathered and you simply wrap it around the chain. I am not really a sewer, but do get by with my basic skills :-) – cutting the fabric on the bias is always a good idea. Loved this! I sat down yesterday and made two. I had some leftover silk fabric and it worked great! What a different it made:)! Thanks for this tutorial! I found it a year ago when I repainted my chandelier but just found it again and made my chain cover. It looks SO much nicer! I have a very short chain so I just used a 97 cent fat quarter from a local discount store. I think this method could be used to cover chains on porch swings, too. The purchased chain covers with snaps are very expensive. Has anyone every tried to repaint a dining room chandelier? I have a gorgeous one BUT it has shiney brass onit. I am thinking of taking it apart and trying to paint it. Help? Last, I will need to buy the small clasps in silver too. Hi Jean – I have the same problem in my kitchen. I painted one in my dining room. Here is the post on how I did that: https://inmyownstyle.com/2010/11/dining-room-chandelier-make-over.html You could do the same treatment on the chain. To paint it: get some paint in the color you desire and use a rag to dab the paint on. Dab only a little bit on at a time and then add a few more light layers until the brass is covered. If you just want to knock down the shine – you may want to use a clear glaze mixed with burnt umber paint. Craft paints will work fine and only cost a dollar or two a bottle. Apply that with a rag. It will still let the brass color come through, but will lessen the brightness and make it look like aged brass. If you are trying to get the whole fixture to be silver – you could just use a metallic spray paint over everything. Diane, you are so clever. I love your website. This chain cover is so creative. I love all your DIY projects that I have read/seen. Thanks for sharing with all of us. Hi Diane, I’m getting ready to give my own chandelier a makeover. I can’t wait to use this idea! Thanks so much. It is not hard to make and adds a nice detail to the chandelier. Just thought I would let you know that I made my chain cover today. I had my laptop in my room while I ironed and went step by step through it. I am going to do the same for my readers and link back to you. You are welcome Sandy – You are so cute taking your laptop right next to your work space. Thanks for linking it too. Thank you! I Googled for chandelier chain cover without sewing… and you came up first! I was thinking of doing something like this, but didn’t know the dimensions of how much fabric to get or products. So glad you found me. 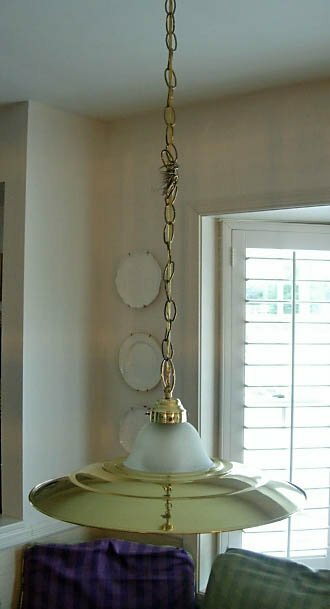 It is very easy to make and if you look at my post dated 5/16/2011 you will see one that I made for a two story chandy chain. It is long and I had to piece together a few long sections of fabric to make it, but when it is all ruched up you would never know. I recently saw in a catalog something that looked exactly like the chain cove , but it was used to cover a bunch of cords that ran under a desk. I thought that was a brilliant idea. So not only will it work for chandy chains, but unsightly cords, too. Thank you SO much for this! I repainted my chandelier a few years ago but didn’t think to add a chain cover then, and now it would be a BIG pain because we’d have to take apart the wires and such. I never thought about doing it with velcro, and I love that I don’t even need to get out my sewing machine! Yippee! A great idea for covering up those chains. Thanks for the tutorial!